It’s back-to-school season and you know what that means – back to setting the alarm, back to preparing school lunches, and back to everybody’s favorite pastime – homework. If your kids are like mine, homework gets done anywhere and everywhere between the kitchen table and the family room floor. And while it doesn’t much matter where homework gets done, it’s sure nice to have a dedicated space for your child to remain focused and organized while they learn. And hey, having all their papers and books out of the way doesn’t hurt either. Now that my youngest is entering the 1st grade, it’s high time I scored him a great kid’s desk at an affordable price. Looking to do the same for your kids? Relax and put your feet up! 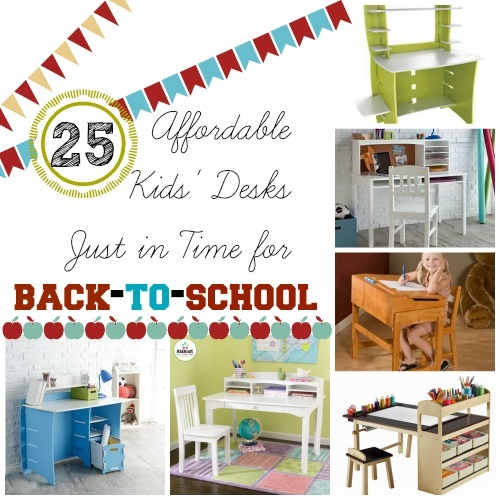 I’ve got 25 of the greatest affordable kids’ desks just in time for back-to-school; check ’em out!